Delivering a fresh take on traditional conference formats, SIMS aka Selina International Music Summit focuses on presenting real-life and practical advice through workshops and sound. This spring SIMS will head to Colombia's up and coming creative hub Medellin from 16th May – 18th May, and Mexico's vibrant capital Mexico City from 23rd – 25th May. Descending on Colombia's culture-rich second city Medellin for the first instalment of the conference; promoters, artists, label owners and industry representatives will come together to shed light on the fast-growing and diverse musical underground culture thriving in the city. With input from the likes of VEVO, WeTransfer and Dazed, as well as talent in the form of J.Rocc and Peanut Butter Wolf, with local names Lianna, Ha$lopablito and DJ Playero stepping up, the stacked weekend summit will cost you $12 for a day pass, or $32 for the entirety. 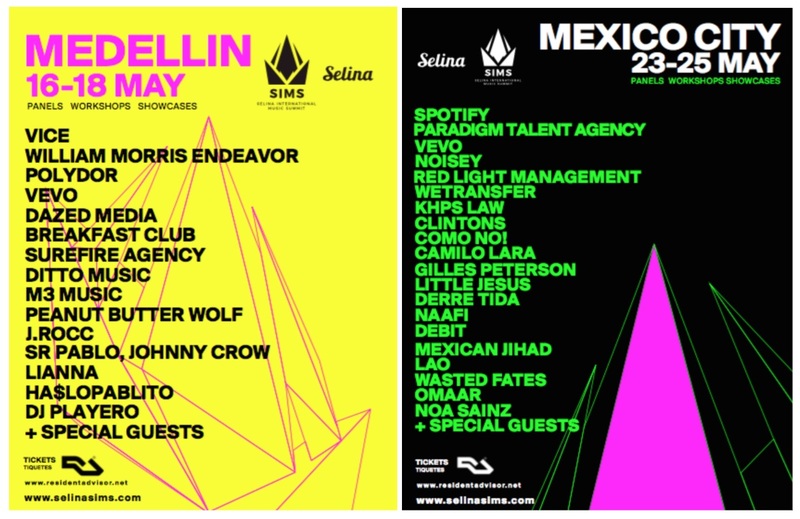 The innovative SIMS heads to Mexico City for the second weekend – a place where latin flavours from the south influence rap, electronica, pop and more for a unique and evolving musical climate. Delivering another stimulating array of showcases, panels and workshops, names and brands like Gilles Peterson, Little Jesus, Mexican Jihad, Omaar, VEVO LatAm, Noisey and Spotify are involved across the weekender.